It's been a few years since JM de Guzman had a movie (was Tadhana the last one?). Anyhow, since he's one of the handful of Filipino actors of his generation that I like, I decided to watch his latest outing Last Fool Show. 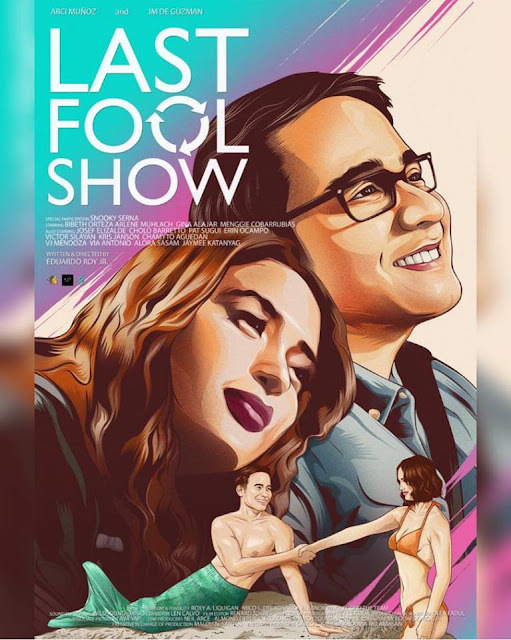 It was a bit tedious to watch Last Fool Show mainly because I don't understand how supposedly two high achieving characters - JM is an app developer while Arci Munoz is an acclaimed movie director - allow themselves to be abused like that by the people they supposedly love. Successful sa career, tanga sa pag-ibig? I don't buy that BS because I have seen very successful people who don't allow their lovers or partners to BS them! Your BF or GF is cheating and you can't sense it? Again, I don't buy that BS, especially in this day and age of social media! So to see these two smart people acting like stalkers on their respective lovers begs belief. With their level of intelligence, that would be a low for them. Anyway, the movie does get better towards the end - as it asks important questions that people in relationships usually ask - will you follow the one you love abroad and sacrifice your career or will you stay here (this has been asked in that Lea Salonga - Aga Muhlach classic, Sana Maulit Muli - a fantastic tearjerker). However, since the movie's protagonists spent more than half of the movie chasing their cheating partners - this part - which would've grounded the movie - was given the short shrift. The two main leads do try their best but the script is a bit absurd in some parts. Would a single girl really share the same bed with a guy he barely knows? Or go to Boracay with him to stalk their cheating lovers? I don't know - it doesn't seem realistic that they would do that. I wish that part was shortened because when the climax happened, the two cheating partners were not even worth the time and effort of the two main leads - so there goes the wasted part of the movie. Also, rom-coms need chemistry which I did not feel in the movie. Both JM and Arci are competent actors but I don't feel the chemistry between them. It's one of the strangest x factors in any rom-com and the most important - so a screen test should've been made to see if they spark when they are together onscreen. I also don't know of any rational formula just that you sense it if two actors have that vibe, without trying too hard. No spark, the audience couldn't care less if they end up together.